Robert Draper, “Trump vs. Congress: Now What?,” The New York Times Magazine, 26 March, 2017. Steve Bannon ain’t so bad in my book! And Bannon’s economic nationalism is on the right side of history. That is an apt poem for our times. We have forgotten what our ancestors understood: people are generally tribal by nature, whether it’s their own tribe, ethnic group, religion, or nation; and they tend to seek, and be happier with, their own people. Multiculturalism is a colossal experiment against human nature. If we look at the past, we can see that the truly multicultural states tended to be authoritarian empires: e.g., the Roman empire, the Byzantine empire, the Arab empire, the Mongol Khanate, the Ottoman empire, the Austro-Hungarian empire, the Russian empire, etc. The evidence suggests that multicultural societies have required harsh and even brutal authoritarian governments to keep people in line and to prevent ethnic and cultural conflict. And even in these empires and states, different groups tended to self-segregate anyway. Even in Europe, multicultural states like Yugoslavia and Czechoslovakia proved unworkable. A major reason why the Soviet Union – which, territorially speaking, was just a continuation of the old Russian empire – fell apart was that non-Russian nationalist ethnic groups wanted their own cultural and national independence. And even in the West our experiment with increasing diversity has resulted in a massive surveillance state, quasi-authoritarianism, and increasingly draconian attacks on free speech: largely because one particular imported culture (and we all know which one) breeds a violent extremism. Finally, there is also another important point to mull over: the kind of class-based politics so beloved by the Left is only really possible in a homogenous society. When everyone or most people are the same it is easy to focus people’s attention on class issues and issues of economic injustice. But a multicultural society destroys that kind of politics and instead focuses people’s attention on different issues: issues of (alleged) discrimination, racism, ethnic and cultural conflict, and increasingly a tribal concern for your own ethnic/cultural group as opposed to other competing ethnic/cultural groups. In the end, politics in the truly multicultural society will just transform the West into a fragmented, dysfunctional, corrupt version of much of the Third World, where politics is essentially all about ethno-tribal conflict to seize control of government and push the interests of one ethnic/cultural group at the expense of others. There was a time – in the early 20th century – when even Liberals would have understood this. This is why towards the end of the First World War and afterwards Liberals supported national self-determination and independence: e.g., this is why the American Liberal left under Woodrow Wilson supported the break-up of the failed multi-cultural, multi-ethnic Austro-Hungarian empire, and separate nations for different ethnic groups. But today European Neoliberal elites are working to create mini-multicultural empires within the borders of each West European state. How will this end? I hope this will not be the epitaph for the Trump presidency: that he was a man with good instincts ruined by free marketeers and GOP Cuckservative advisors. 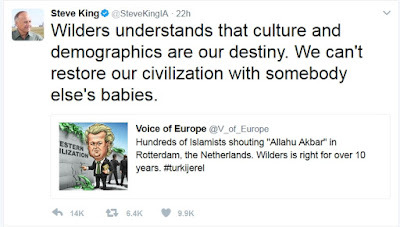 Steve King is correct that multiculturalism and diversity are not strengths, as anyone can see from the evidence here. As for the ethnic issue, even on this subject, conservative Republicans can’t even state the obvious: would it be acceptable for native Africans to be demographically replaced by white Europeans assimilated into African cultures and speaking native African languages? Would it be acceptable for native Chinese, Japanese, South Asians, and Arabs to be demographically replaced by white Europeans assimilated into these respective cultures and speaking the native languages of China, Japan, South Asia and the Middle East? We would then have a world where ethnic Africans, Chinese, Japanese, South Asians, and Arabs have disappeared, and been replaced by white Europeans, even if they were assimilated Europeans. Diversity – which is supposedly so beloved by the Left – would have actually significantly decreased in the world. The answer to these questions is: no, it’s not acceptable to just demographically replace native Africans, Chinese, Japanese, South Asians, etc. with assimilated Europeans. It’s an outrageous – and even an evil – idea. E.g., native Africans have a right to their historic homelands in Africa, which should remain majority homelands for the African people and culture of those people. The same applies to Europe and any other region or people. Zack Beauchamp, “No Easy Answers: Why Left-Wing Economics is not the Answer to Right-wing Populism,” Vox.com, 13 March, 2017. This is surprisingly astute, even if certain parts are unpleasant. The issues that drive modern politics now are endless Third World mass immigration, open borders, and all the insanity spawned by the Cultural Left. As I said here, it isn’t enough for the modern Left to simply support left heterodox economics while they continue to support Cultural Leftism and open borders, because the latter are growing so hated they are the kiss of death. Endless multiculturalism and diversity are suicidal policies, as anyone familiar with the evidence here should be capable of seeing. It’s precisely because Social Democracy and “Socialism” are associated with open borders and Regressive Left insanity that has led to the collapse of, say, the UK Labour Party. The secret to reviving the modern Left is not ditching left heterodox economics, however: it is ditching Cultural Leftism and open borders, and returning to immigration restriction and some kind of sane social and cultural policies, and recognition that people in the Western world require some kind of national identity and policies to preserve that identity. Only then will people be able to focus on economic issues again, and a left heterodox economic program can be used to win over electoral majorities. But you have to solve the crisis of national identity first. That crisis of identity won’t go away and is illustrated perfectly by a recent Tweet by a Republican congressman called Steve King. That Tweet, predictably, broke the internet. It represents a new-found public expression of what is actually not well understood by the public: because of low fertility rates in the West that have fallen below the replacement level of 2.1, modern Neoliberal governments see mass Third World immigration as a way of maintaining population levels and (they think) a way of maintaining taxation. But in, say, Europe that means mass *demographic replacement* of native Europeans by the year 2100 and the cultural collapse of Western civilisation in Europe. Quite simply, you would have to be stark, raving mad to think such a policy will not provoke a furious, unprecedented backlash from the general population once enough people realise what mass Third World immigration actually entails. What we see now in the rise of the populist right is only the beginning of that backlash. Pool went to Sweden to investigate claims of severe problems with mass immigration. The video was even posted by WikiLeaks in this Tweet here. And still the deranged, idiotic Liberals and cultural leftists refuse to admit any problem of any kind with Third World mass immigration into Europe. The Swedish government recently even reintroduced military conscription, supposedly against the evil Russians. Who are these people kidding? The only real threat to Sweden is an internal one as the country gradually plunges into lawless anarchy and civil war. The concern with re-shoring US manufacturing and open support for protectionism is excellent. Ending illegal immigration and reducing legal immigration is what America needs, so a reduction in legal immigration by a shift to a merit-based immigration system (if this is what will happen) is a step in the right direction. This is a pro-working class position. In my opinion, however, this doesn’t go far enough: H-1B visas in America should be abolished immediately and a moratorium on all Third World mass immigration should be introduced. If any government wants to raise wages and increase job opportunities for its citizens, then breaking the addiction in the West to the unending flow of cheap Third World labour is vital, and immediately. I don’t see how Trump can (a) cut taxes and (b) increase defence and infrastructure spending without massive Federal deficit spending. Hopefully immigration restriction, with industrial policy, and massive Keynesian stimulus with actually turn the American economy around. A real danger is another financial crisis and the temptation Trump might have to give in to the fiscal conservative hawks. On the negative side, deregulation was always going to be part of the Trump program (we knew this from the beginning), but that can be fixed by a future Democratic government that isn’t a Neoliberal train wreck. The health care reform seems a mess, and the only effective solution is a universal system free at the point of delivery: the rich and upper middle class can continue to buy private health care. A universal system free at the point of delivery would increase disposable income for households and help corporations reduce costs, so that it would be part of an industrial policy. The government debt hysteria was unfortunate. The poorly-regulated financial sector and the huge level of private debt are the two biggest issues that are not being addressed. On foreign policy, the anti-Iranian moves cave in, to some degree, to Neoconservative and other lobbies in Middle East, but hopefully this won’t go too far. It is unclear whether the administration is retreating from what might have been a badly-needed détente with Russia.